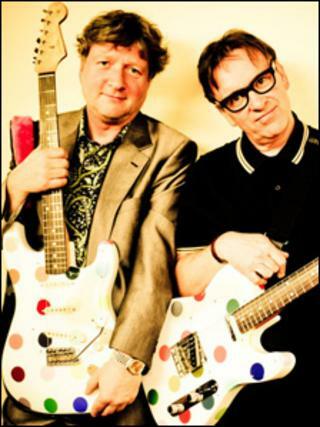 Reunited band Squeeze will play an exclusive set of instruments designed by Damien Hirst when they headline a charity concert later this month. The collection features two guitars and a drum kit, all of which have been hand-painted with the artist's iconic spot design and signed by him. Squeeze will be joined by The Feeling at the Teenage Cancer Trust gig on 22 March in London's Royal Albert Hall. The instruments will be sold off in an auction later in the year. The Fender Stratocaster guitar and the Yamaha drum kit will go up for sale at Christie's April auction of post-war and contemporary art. It will raise money for two music-focused cancer charities, the Love Hope Strength Foundation and Teenage Cancer Trust. The second guitar, a Fender Stratocaster, will be auctioned in September. Simon Davies, chief executive of the Teenage Cancer Trust, said: "We've been staging our concerts at the Royal Albert Hall for over ten years and had some huge stars perform for us, but we've never combined such exceptional art and music in such a creative way before." This year's series of gigs includes a comedy night featuring John Bishop, Kevin Bridges and James Corden, and concerts including artists such as Jessie J, Tinie Tempah and Liam Gallagher's new band, Beady Eye.